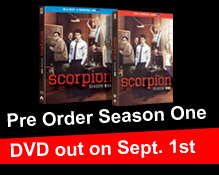 Scorpion Season One is out on DVD September 1st. You can pre order on Amazon. Can’t wait for September 1st? You can rewatch Season One on CBS All Access. Get One Week free by signing up here (Please note you will be redirected to the official CBS All Access Website). After your one week free it’s $5.99 per month thereafter. You can also purchase Season One of Scorpion on iTunes. Watch Scorpion reruns every Monday 9/8c on CBS. View the CBS schedule here. Scorpion Season Two Premieres Monday, Sept. 21 9/8. Join the discussion on the forum. Not a Member? Sign up Today! Please note the DVD features noted above are only on the Season One DVD Set. They are not available on CBS All Access or iTunes.